I grew up watching James Bond and separating the quality of the films from the nostalgia I feel watching them is somewhat difficult. Even the worst films in the series hold a special place in my heart, while the best films in the series have some very visible flaws. Still, some entries in the series, like From Russia with Love, manage to keep things relatively low-key, making their flaws less glaring. I wouldn’t call this a smart film, but compared to some of 007’s other adventures, it’s tight, exciting, and a lot of fun. From Russia with Love is the second film in the series and is one of the most highly regarded. In the film, SPECTRE devises a plot to obtain a large sum of money by stealing a Russian decoding device, the Lektor, and selling it back to them. They’ll accomplish this by duping British superspy James Bond (Sean Connery) into stealing the device for them before killing him (which will be all the more satisfying considering he killed SPECTRE operative Dr. No) and taking the Lektor for their own gain. Bond is drawn in by the promise of the Lektor and the lust of a woman, Tatiana Romanova (Daniela Bianchi), who operates the device. She’s being handled by Rosa Klebb (Lotte Lenya), a former Russian agent who has defected to SPECTRE but maintains the guise of her old post. She orders Romanova to seduce Bond (for no particular reason). 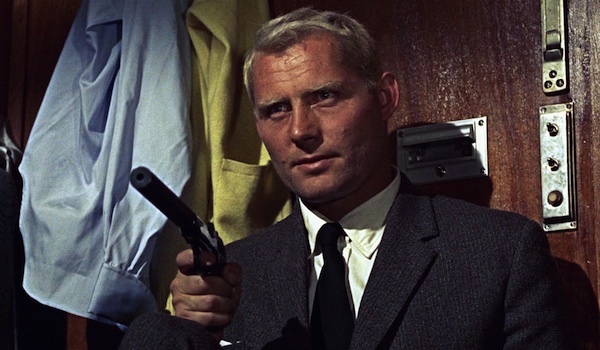 She also hires Grant (Robert Shaw) as the man who will kill Bond—and Romanova—and take the Lektor to Klebb. It’s a complicated plan, but it’s seemingly perfect because it preys on the weaknesses of all involved. Bond can’t resist a pretty woman. His higher-ups can’t resist the chance to obtain a Lektor. And Romanova can’t say no to an important task from someone like Klebb. Of course, SPECTRE doesn’t exactly know who they’re dealing with. Many Bond films deal with megalomaniacal individuals who concoct these implausible, fantastical schemes to take over the world. The best films in the series, however, usually deal with criminals who want to make some money. Their methods may be evil (and sometimes hard to follow), but the end result is somewhat subdued. From Russia with Love has one of the simplest plots of any Bond film. Within the scope of the series, it comes off as a quiet, straightforward entry. That being said, it does have some really exciting, well-choreographed action scenes that are anything but quiet and subdued. The fight between Bond and Grant on the train is one of the best of the entire series. The stealing of the Lektor is quite exhilarating. And the chase between Bond and the plane is a great copycat of the famous North by Northwest scene. No one will ever top Sean Connery’s portrayal of James Bond, and in From Russia with Love, he just might give his best work of the series. He’s charismatic, but unlike Roger Moore, he doesn’t let jokes or gags get in the way of the movie. He’s brutish and clever, and since Q’s gadgets don’t overwhelm the picture, we get to see 007’s true ingenuity. Daniela Bianchi is a solid Bond girl, but her character gets quite irritating toward the end. Robert Shaw and Lotte Lenya are both in the upper tier of Bond villains—albeit for different reasons. Shaw’s Grant is a silent killer—very threatening and imposing. Lotte Lenya isn’t a match for Bond physically, but she’s resourceful and intimidating in an authoritarian sort of way. Her final scene is another of From Russia with Love’s best. This really is the film in the series that shapes what we think Bond is. The cast and crew worked the kinks out of Dr. No and started really developing what’s known as the “Bond formula.” It’s full of all the things we expect from a Bond film—beautiful women, exotic locales (Istanbul! ), lots of action and intrigue, and the James Bond theme, of course. Influence aside, however, this is still a damn good film.